Serves in a leadership capacity with senior management in facilitating the understanding and application of the Mercy mission and values into organizational decisions, practices and activities. Participates in senior management decision making to promote the Mercy mission and values as an integral part of the organization's culture, strategic planning, policies, programs and practices. Provides formation in meaningful and measurable ways and in a variety of formats to board members, executives, leaders, integrated and aligned physicians, and co-workers in all Mercy sites. Encourage initiatives of well being within physician communities through the coalition for physician well being. Responsible for Mission Integration with Presence Health physicians throughout 150 locations throughout the state of Illinois that includes 12 hospitals, 27 long term care and senior living facilities and 98 clinics. Developed a system wide provider engagement program called C.O.R.E. to promote physician well being and wellness. Developed and launched the first physician orientation within Presence Medical Group. Oversee the system wide service opportunities for all Presence Health employees. One of 22 selected from 19,000 employees to participate in an Executive Accelerated Development Program with Korn Ferry to develop a workforce strategy for Population Health. Launched a Global Summit and conducted an international site assessment experience to engage Global Outreach at Presence Health integrating our Sponsoring congregations. Provided leadership, direction, guidance and consultation toward the development and implementation of policies, procedures, activities and practices that support an understanding and integration of the Presence Health mission, values and identity throughout the Presence Medical Group. Responsible for assessing the mission service needs, deficits and weaknesses throughout the medical group and to plan, develops and implements activities, programs, experiences and rituals to meet those needs. Nyumbani Children's Home is Kenya's first and largest facility for HIV+ orphans where abandoned children receive the best medical, nutritional, academic and holistic care possible until they become self-reliant. Advised the Global Center at the department of Christian Commitments for World Vision international International on various projects. Advised CEO on areas ranging from financing and capitalization, to pricing and distribution, investor relations, and employee development and retention. Competed for highly selective position to direct field organizing for grassroots initiatives and volunteer recruitment on behalf of the President of the United States. Served as a consulter for fiscal and strategic institutional planning, advisor on global assignments for personnel, developed marketing web-based strategy for organization and public speaker for mission, identity and fundraising. Taught 9th & 12th grade theology. Coached baseball and track. Directed the musical. Developed programming for pediatric patients in the cancer and burn units of Loyola Medical Center. The purpose of this case study explores the impact of an immersion experience to a least developed country on the vocation of lay teacher leaders in American Jesuit high schools. Nine lay teacher leaders engaged in a four stage process of immersion from November 2009 to August 2010. The study employed the conceptual framework of Edward Hahnenberg’s, “Awakening Vocation” to develop a self-understanding of a lay teacher leader’s call. The writings of Paulo Freire, Fredrick Buechner and Parker Palmer informed the study's exploration of vocation. Poetry from Mary Oliver and William Stafford functioned as a method for articulating a lay teacher leader’s vocation both before and after the immersion to Dodoma, Tanzania. The following themes were found to influence a lay teacher leader’s vocation through an immersion experience: reverence for solitude, a unique process of self-discovery, motivation to work in an institution with a mission of men and women for others, solidarity with the poor and development of adaptability skills. A checklist for institutions seeking to impact a lay teacher leader’s vocation through professional development was generated as a summary of the immersion experience in this case study. Led the 120-member fraternity organization. Responsible for public relations with Oxford community and Miami University. Oversaw all financial activities and recruiting for the organization. Responsible for the oversight and revision of current pedagogical practices. Worked with faculty and staff on curriculum development. Assisted with the revision of various degree program handbooks. Administered and oversaw the implementation of the Lilly Foundation grant at Loyola University Chicago. Implemented new leadership program called Leadershape. Oversaw the daily life of 13 HIV-positive children in a 100 children orphanage. Responsible for teaching at the primary school with forty students. Consulted on daily home visits to end-of-life patients with HIV. Worked to implement outreach programs in pre-natal care for mothers’ with HIV in the slums of Kiberia, Kawangware, and neighboring slums. Coordinated an immersion to various social outreaches in San Salvador. Advised a group of university administrators on developing social health programs of exchange between San Salvador and the United States. Created and implemented a six month training program for administrative educators in the Midwest Jesuit schools. Led a cultural exchange with teachers from Dodoma, Tanzania and the United States for the purpose of motivating and developing future school leaders. Consulted and advised Vice President of Student Affairs and staff on a wide range of issues including: threat assessments on campus, student health policies, residence life crisis management and strategic planning for the athletic program. Advised principal on all aspects of curriculum in a charter school of Chicago. Developed professional development programs for educators in charter schools. Consulted the major Jesuit official on all matters pertaining to the largest religious order in the Roman Catholic Church. Marketing, financial strategic planning, legal council and personnel assignments throughout the world were common activities in this role. Developed and implemented procedures and policies for integrating the Jesuit mission into the curriculum and parent programing. Created a profile for board of trustees members. Taught 9th and 10th grade theology. Conducted discipline reviews for suspension of students. Moderated the sophomore class. Coached baseball and soccer. Led immersions with Loyola High School Detroit, University of Detroit Jesuit and John Carroll University. Taught in local primary school. Coordinated a parish educational outreach to the orphans. Evaluated social health policies for Casa Ricci in Maowangdong village, Yunnan Province, and Southwestern China for Lepers. Studied International Cultural Social Services throughout the region of China. Supported a team of social workers at Casa Ricci developing programs in the surrounding villages of the leprosarium. Coordinated a teacher immersion to Dangriga, Belize with university students from the University of San Francisco. Instructed new teachers on pedagogy and cultural practices for learning. Advised ethical team on end of life issues. Wrote briefs on various health care ethics issues for staff and physicians. Led medical students from Loyola University Medical Center to work with Mother Theresa’s sisters at the home for the dying in Port-a-Prince. Coordinated home visits for the medical students in the village of Fond de Blanc. Developed programming for pediatric patients in the Cancer and Burn unit. Worked with Veggie Tales co-founders to provide an interactive program for pediatric patients. Directed and coordinated over 50 youth retreats for high schools in the Cincinnati area. Studied in a cultural immersion center during the summer with direct outreach to the street children of Lima, Peru. Ran the soup line at the Catholic Worker in New York City one day each week. Oversaw the nightly care of homeless men at the homeless center at Xavier High School. Cared for HIV patients and elderly homebound patients. Facilitated and led a site assessment with health care providers to establish a link with health systems. Participated in the international summit on HIV in Nairobi Kenya as Executive Vice President. Facilitated and coordinated an immersion with high school administrators and teachers from Jesuit high schools. Facilitated a training seminar for administrators in Jesuit Higher Education. Studied at the International University of Business and Economics. Evaluated and worked with various social outreach programs in southern China including: local village schools, a leper colony and social service groups. Researched and analyzed current cultural and systemic social concerns. Coordinated and led faculty and students from the University of Detroit Jesuit High School and John Carroll University. Taught in a local school and supervised faculty and students. 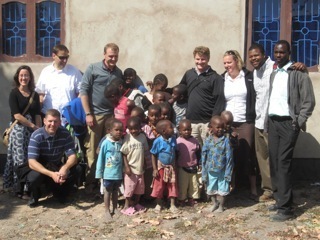 Oversaw student services for an HIV-positive orphanage. Managed student tutoring services. Responsible for providing health care needs to HIV- positive orphans. Supervised and coordinated Loyola University Chicago medical students as part of a medical immersion team.